people to combine programming and journalism. Users of the Youth Radio app respond to polls and post photos in response to stories. Youth Radio then compiles the user-submitted data to create infographics and other content for the app. One of the app’s first stories reported on teen bands in Stockton, Calif., that are using a strip mall as a venue for punk shows because they have nowhere else to play. The app prompted users to send pictures of unused spaces in their communities that could host concerts. Another story, about California’s drought, asked whether users have changed their water habits. News outlets including NPR, National Geographic and KQED in San Francisco have featured Youth Radio’s content, and the organization has also started a channel on the personal publishing site Medium. But the new app, which was finished in June, allows Youth Radio to share content with audiences more directly. “The young people [at Youth Radio] were like, ‘We need to make this. We need to make it easier for young people to get into Youth Radio, and highlight what we do,’” Richardson said. “It shows what we’re known for in terms of stories but also engages people interactively.” By inviting app users to share stories, Youth Radio hopes to bring in new voices, one element of a larger plan to create a national youth-news network, according to Richardson. The app’s development involved young people at both Youth Radio and MIT with collaboration, often in hands-on ways. App Inventor employs just three full-time developers but takes advantage of its location at MIT to use talented student programmers. 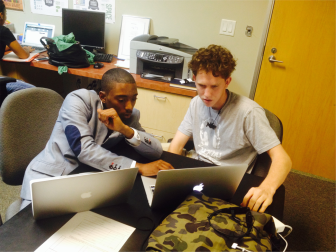 Two such students traveled across the country to advise Youth Radio’s young programmers. The app took about a year to make, from the original idea to its release in the Google Play store. Youth Radio ran into some challenges along the way, including the need for new components to allow users to submit pictures, and slow functionality due to the high quality of the audio originally prepared for NPR. That required Youth Radio to reduce the file sizes of its app-based stories. “There have been some hard days where it just broke, but that’s app development,” Richardson said. The app now features about 10 stories with a focus on health and environment issues. Richardson said additional stories will be featured as downloads increase. According to Google Play store figures, the app has been installed between 50 and 100 times. Youth Radio hopes to eventually update the app with new content weekly, perhaps drawing from its archives to do so, as it looks to incorporate its creation into daily operations. Youth Radio has begun exploring how to develop the app for other platforms, including iOS, according to Richardson. App Inventor, which originally began at Google, is also considering expanding to platforms beyond Android, said McKinney.